We really want a big artificial flocked tree, but we have no where to store it in our one bedroom apartment. Our new rule (for now) is-if it’s flat we’ll go for it! So, we made this flat retro inspired tree and tried out flocking fibers! 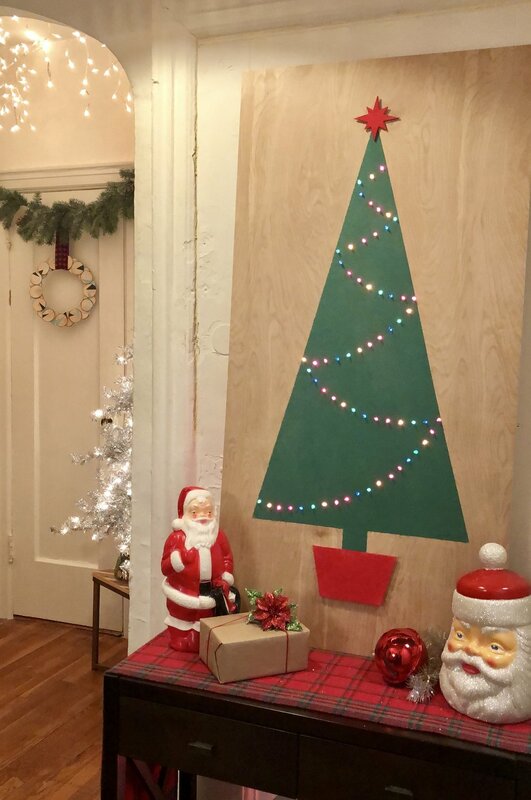 We created our flocked tree on a piece of plywood, drilled out holes for lights and then went through the flocking process. Adding the flocking fibers took a bit of trial and error and is a bit confusing to explain but we cover all of that in the video. We taped a tree outline with painters tape and covered the rest of the board with brown paper. We used Elmer’s Craft Bond Spray Adhesive and sifted the flocking fibers above the tree. Then we pressed down lightly with a piece of parchment paper and shook off any extra fibers that didn’t stick. We repeated the process 3 times until our tree was fully covered. Watch how it all comes together on HGTV Handmade!